For centuries the mighty mountain range between the Indian plain and the Tibetan high plateau has attracted saints, philosophers, traders, and travellers and adventurers. Tourists came only in the last hundred years, starting with the British in the mid-19th century. Today we wander on their tracks, though occassionally we do stumble across unexplored territory. Even the most trodden paths are rewarding, be it on the wind-swept plateau of Ladakh, on the snow-covered passes in Nepal or in the warm jungles of Sikkim. 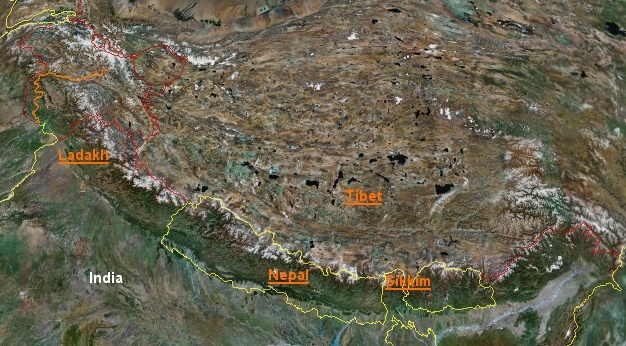 The Himalayas spread over a huge area, and therefore differences in landscape, scenery and culture are also large. I could not tell which area I prefer the most. In order to remember the trek also years later, I write extensive diaries and publish them on these pages. I'm aware that they are too long for most people to read, so feel free to skip the long texts and just enjoy the summaries and pictures.